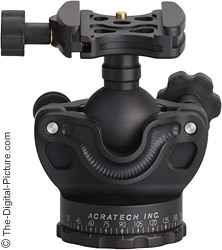 The Acratech GV2 Ball Head's quality build, light weight and attractive skeletal design convinced me to give it a try. First, I love Ball heads. They are one of the best and most popular types of tripod heads available. As the name implies, a ball head consists of a ball with a neck that allows various camera/lens mounting options to be attached to it. This ball lives in a socket or other containment mechanism within a strong metal housing. Friction controls control the rotation of the ball. The primary friction control, the main locking knob, is generally the largest knob with smaller controls adjusting ball tension and panning base friction (if so equipped). Ballheads are small, easy to use, strong and fast to setup. They are the right tripod head type for most applications. Here is a multi-view look at the Acratech GV2 Ball Head (mouseover the links below the product images). Starting with the "Knobs" view above, we can see the 4 control knobs available on the GV2. On top is the quick release plate clamp's knob. The quick release plate is optional on the GV2, but it is a very nice option. You will need an Arca-Swiss-compatible camera body plate (such as the Wimberley P5) or lens plate (such as the Wimberley P20) to use this option. A short less-than-1-turn adjusts the clamp from wide open to locked tight. I find it at least as quick to use as the lever-type locks. A spring-loaded detent pin (gold-colored) is included to help prevent lens plates from accidentally sliding out of the clamp. Most clamps have recessed areas that this pin slips into. The middle-left knob, the largest of the 4, is the main tension control knob. The middle-right knob is used to control the minimum tension on the ball. These two tension control knobs adjust the pressure placed on four points around the middle of the ball. The bottom knob allows easy control over the laser-etched panning base. Because of its design, the base itself is easier to grip than many ball heads. This makes installation/removal onto/from a tripod an easier task - a welcome feature if you are changing heads frequently. All four of these knobs are captive - they will not accidentally back completely out. All four are rubber-coated for ease of gripping. The side view above shows the skeletal design of the Acratech GV2 Ball Head. In addition to being attractive (in my opinion at least), this design keeps the weight down. At 1 lb (450g), this is a very light ballhead. The 4 "Gimbal" views above show an interesting feature claimed by Acratech. Since most ballheads do not allow enough rotation for shooting in portrait/vertical camera orientation (without an L-plate or collared lens), a drop notch is generally provided. The ballhead is then oriented so the neck of the ball can be positioned into this slot - leaving the camera in position for the vertically-framed shot. Acratech took this design one step farther (at first glance at least). Large, collared lenses used on top of ballheads can become hard to control - their generally-heavy weight gives them a strong tendency to fall over. Gimbal-style heads (the Wimberley Tripod Head II is one) are designed so that the gravitation effect simply holds the lens balanced - a real plus when working with these lenses. 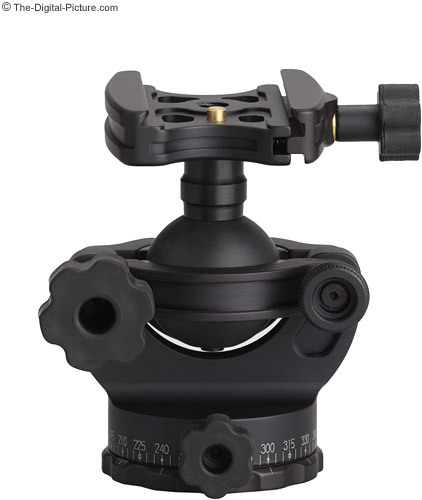 The Acratech GV2 Ball Head functions as a gimbal head when the ballhead neck is lowered into the drop notch. A large lens can be easily positioned and used without locking the friction control knobs. While at first the gimbal feature appears innovative, the innovation seems to be more on the marketing side. The drop-notch included on the Arca-Swiss Z1 Ballhead seems to work just as well for me. Being aesthetically designed for this use leans in the Acratech GV2 Ball Head's favor, but I suspect most ballheads can function in this manner. Mouse over the four gimbal views above to get an idea how this concept works. My clamp angles in these pics are not the most logical - I should have had the clamp angled so the knob was higher in the pic. The clamp knob must be above the lens - it otherwise hits the ballhead base. Make sure your tripod is solid when going gimbal as the weight is no longer balanced in the center of the tripod. Physically, the Acratech GV2 Ball Head has a lot going for it. Going into the field, the first thing I noticed was that my framing moves slightly to the right when I lock down the main friction control knob. I tried a wide range of minimum friction/tension settings with no change in this behavior. With a Sigma 120-400mm DG EX HSM Lens set to 400mm, my framing moves about 1" (254mm) at 15' (4.6m) when the GV2 is locked down. There is no elevation drop as is common with cheap heads, but the rightward movement is definitely the biggest negative attribute of this otherwise great ballhead. The GV2 has some slip-stick behavior when near tight, but I didn't find this to be hindering in the field. I included a mouseover size-comparison image of the Arca-Swiss Z1 Ballhead above (the clamp is made by RRS). This continues to be my preferred ballhead. It is not as light however. The Z1 is obviously rated for significantly more weight than the GV2. However, I did not notice a difference in the vibrations/stableness of these ballheads with a moderately heavy Canon EOS-1Ds Mark III and a Sigma 120-400mm DG EX HSM Lens mounted on them. These two ballheads share a similar height and width, but the GV2 consumes less volume due to its skeletal design. 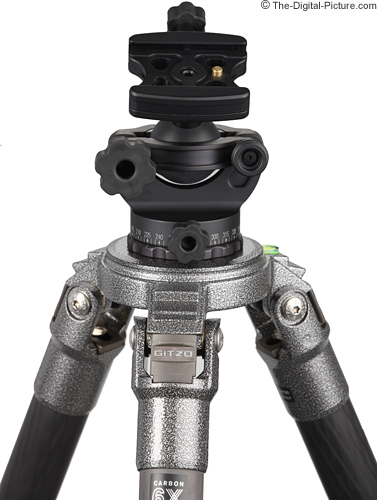 The Acratech GV2 Ball Head is shown mounted on a relatively large Gitzo GT3530LSV Tripod above. 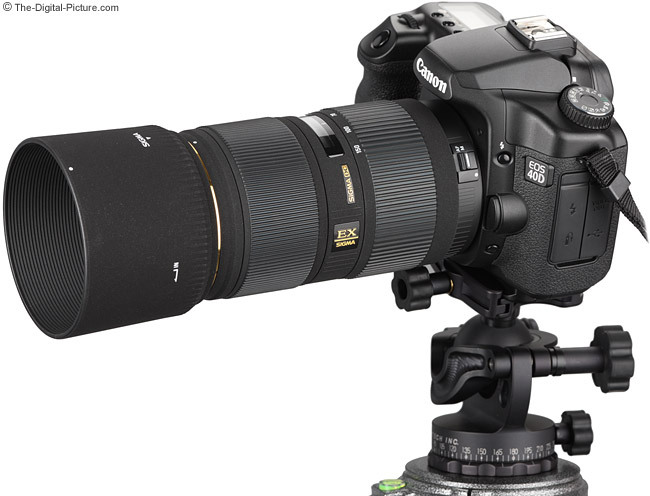 The GV2 below is supporting a Canon EOS 40D DSLR and Sigma 50-150mm f/2.8 II EX DC HSM Lens. The Acratech GV2 Ball Head is a quality-construction, well designed tool.